Studyfinder is a web-based recruitment tool for Penn State researchers, managed and sponsored by Penn State Clinical Translational Science Institute (CTSI). It is available to all Penn State researchers actively recruiting participants or volunteers for studies. Studyfinder displays data in a way that is intuitive and user-friendly for the public. Information is updated once per day upon receipt of IRB approval and is retrieved from the CATS IRB smartform Studyfinder Recruitment page. If clinical trials registration is required for the study, further information will be gathered using the NCT number and pulled from ClinicalTrials.gov. Study information provided in CATS IRB must be presented in lay language to be most effective in reaching potential participants. Periodic review of study information in CATS IRB is encouraged to help potential participants connect with available research. For more information on the Studyfinder project, email Dr. Neal Thomas, associate dean for clinical research, at nthomas@pennstatehealth.psu.edu. Only those studies that have indicated in CATS IRB that they wish to use Studyfinder as a recruitment tool are included on the Studyfinder website. The website will pull trials once daily from CATS IRB if a modification to use Studyfinder for recruitment has been received and approved by the IRB. Investigators must follow the steps below to have their studies listed on Studyfinder. Studies will not be included on the site unless they are updated in CATS IRB. Choose “Yes” to include your study in Studyfinder once it has been approved by the IRB. Questions 2 through 4 are pre-populated from other sources and are not editable on this form. To change the title or lay-language description of the study, do so on the Basic Information page. General CATS description: Interventions that increase activity levels have great potential to improve the public’s health. We propose developing and pilot testing games and organized noncompetitive sports for adults. We will modify sports using smaller fields and lighter balls to be less physically demanding, given that many adults lack the confidence to participate in strenuous sports. This pilot is being conducted to determine the feasibility of IRB#1861. Good lay-language summary: Increased activity levels improve the public’s health. Volunteers will participate in games and organized noncompetitive sports for adults. We will modify sports using smaller fields and lighter balls to be less physically demanding. 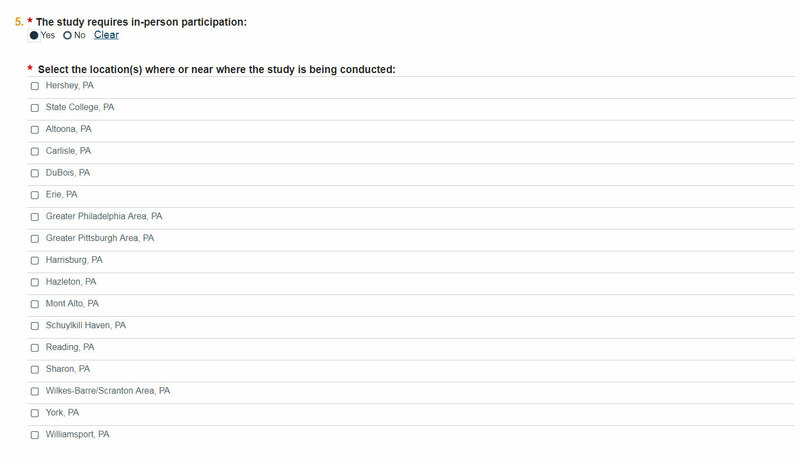 Studies completed by phone, mail, online survey, etc., should be marked “No” to “The study requires participants to travel.” For in-person research, choose the location or locations nearest to which the research will be conducted (your campus). Generally, more than two locations are not needed, but any that are applicable can be selected. Provide answers regarding the general age and gender of eligible participants, as well as if healthy volunteers are also needed. More detailed eligibility criteria (i.e. specific age ranges) can be provided in later questions. 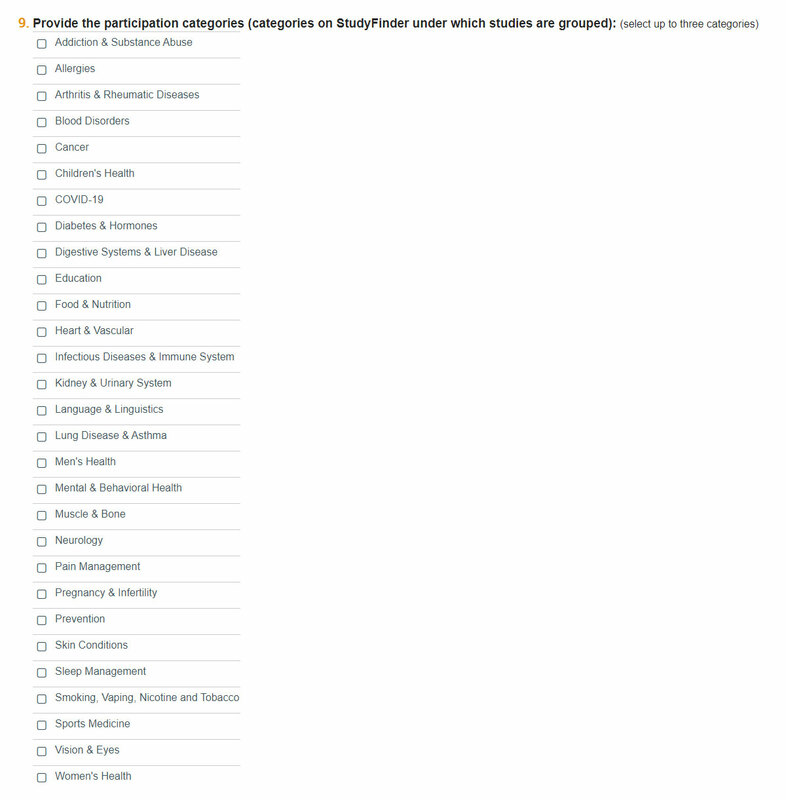 Choose up to three categories in which you wish your study to appear on the Studyfinder Search for a Study page. 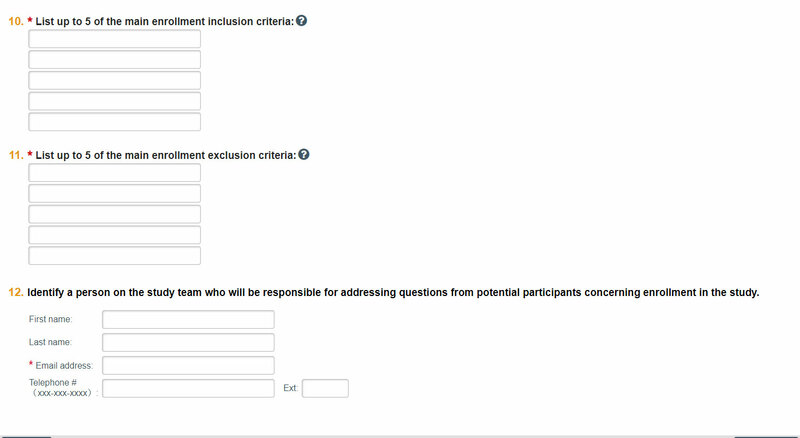 Provide specific inclusion and exclusion criteria and contact information. Examples might be detailed age ranges (such as 55 and older), having a particular condition, being a smoker or non-smoker, etc. The contact provided will receive an email notification from Studyfinder if someone expresses interest in this study. Verify that the email address is valid. If necessary, update the appropriate submission documents to include Studyfinder as a recruitment tool (e.g., protocol documents, recruitment materials, etc.) and submit the Modification or Modification/CR. If you are finished recruiting or no longer wish to use Studyfinder as a recruitment tool, create a Modification or a Modification/CR in CATS IRB. Select “No” on the Studyfinder recruitment page. If necessary, update the appropriate submission documents to remove Studyfinder as a recruitment tool (e.g., protocol documents, recruitment materials, etc.) and submit the Modification or Modification/CR.